Published: Dec. 16, 2017 at 06:05 p.m.
Chicago Bears knock ball loose and force fumble in waning seconds of first half. Published: Oct. 4, 2015 at 03:45 p.m. 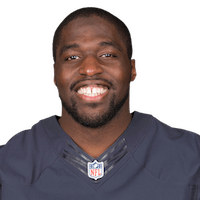 Published: Aug. 13, 2015 at 10:52 p.m.
Chicago Bears linebacker Sam Acho intercepts Miami Dolphins quarterback McLeod Bethel-Thompson.